At a typical trade show, you’ll find more tchotchkes than there are flies at a barbeque. The choice of the perfect item that provides the right mix of clever, cheap, relevant and memorable is an area of much discussion and much pride. Marketing and sales people love to pass out tchotchkes and they love to talk about how popular they are with the crowd. When Trade Show Samurai learn the Tao of Tchotchkes they understand that the purpose of the tchotchke is to politely bring an end to your conversation with the attendee so you can quickly move onto the next one. This is philosophically different than the conventional wisdom which thinks that their purpose is to attract people to your booth. I recently heard about a company who hired three lesser-known NFL players to sign autographs in the booth using a logo-adorned photographs. There was a long line and the company was beside themselves with glee at the crowd that had formed even though they had failed to capture lead information from anyone. They figured that the logo on the photograph would be enough. While I’m sure that having your logo on a signed photograph is better than not having your logo on a signed photograph, it isn’t as good as a stack of qualifiable leads. Just because someone comes to your booth doesn’t mean they are going to buy your product. The right tchotchkes will serve the Trade Show Samurai as a conversation-ender. The Trade Show Samurai picks items that provide the proper “thank you” for the conversation. Evanston, Illinois-based Inclusion Solutions is a company that helps small businesses increase access to people with disabilities. They use trade shows to target convenient stores, gas stations, and drive-through restaurants. They pass out a small, branded box of mints to attendees. The mints are an excellent choice because they are clever, cheap, relevant and memorable. Perfect. 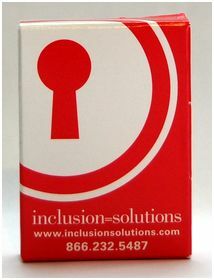 Patrick Hughes, President of Inclusion Solutions, gives the mints to clients and prospects year round. The Trade Show Samurai doesn’t mind that nearly all tchotchkes wind up in the trash. He or she knows that once the conversation has ended successfully the tchotcke has fulfilled 100% of its intended purpose. It is intended to capture a moment in time; the moment after you capture a lead.